There is much confusion over the different terms that you may hear on the news attributed to the thousands of people moving from their home nations to the EU. The information below is 'need to know' before you start your study on the current EU migrant crisis. "Asylum seeker" means a person who has applied for asylum under the 1951 Refugee Convention on the Status of Refugees on the ground that if he is returned to their country of origin they has a well-founded fear of persecution on account of race, religion, nationality, political belief or membership of a particular social group. That person remains an asylum seeker for so long as their application or an appeal against refusal of an application is pending. "Refugee" in this context means an asylum seeker whose application has been successful. In its broader context it means a person fleeing e.g. civil war or natural disaster but not necessarily fearing persecution as defined by the 1951 Refugee Convention. During mass movements of refugees (usually as a result of conflicts or generalized violence as opposed to individual persecution), there is not - and never will be - a capacity to conduct individual asylum interviews for everyone who has crossed the border. Nor is it usually necessary, since in such circumstances it is generally evident why they have fled. "Economic migrant" means a person who has left his own country and seeks means to find employment in another country. Task 2 - Study the presentation above created by Richard Allaway. Make your own copy of the model as set out in slide 20/21 including a key to show what +, - and 0 represents. Task 3 - Now watch the news report to the left hand reporting on one of the migrant stories in the Mediterranean. Listen carefully to what is said and pay particular attention to names of places, so that you can fill in details for origin, destination and the intervening place (where they are being interviewed). Also pay attention to the push and pull factors as well as the intervening obstacles that have affected this particular group of migrants. Annotate your copy of the Lee's Migration Model with this information. Refugees - Always two sides to the story? Screen grab of Daily Express (UK) and their coverage of immigration into the country. Task 3 - Click on both of the images above to enlarge. Study each one carefully as both represent a differing viewpoint of migration. Complete the worksheet below to help you to analyse both viewpoints. TOK talking point. Why are British people who migrate elsewhere in the world called "ex-pats" when others who arrive in the UK are called "immigrants"? What's the difference between an "ex-pat" and an immigrant? Syrian refugee Hashem Alsouki risks his life crossing the Mediterranean, his sights set on Sweden – and freedom for his family. Read the story carefully (right) and listen to the embedded audio files as well as watching the videos. Task 4 - Create a basic map that shows the movement of Hashem from his home in Syria to his final destination in Sweden. You might want to use this summary timeline of events from the article. Task 5 - . Complete the Feelings Table that charts Hashem's journey giving an example from the text for each emotion. Task 6 - Now annotate onto your map each of the feelings, perhaps by using a different colour (think about association red=angry, pink = love etc.). Which are the parts of the journey that have the highest concentration of emotional stress? Are there any positive areas? The map below shows the number of asylum applications per country since 2010. You can click on each country to view the data for a particular country over a five year period. 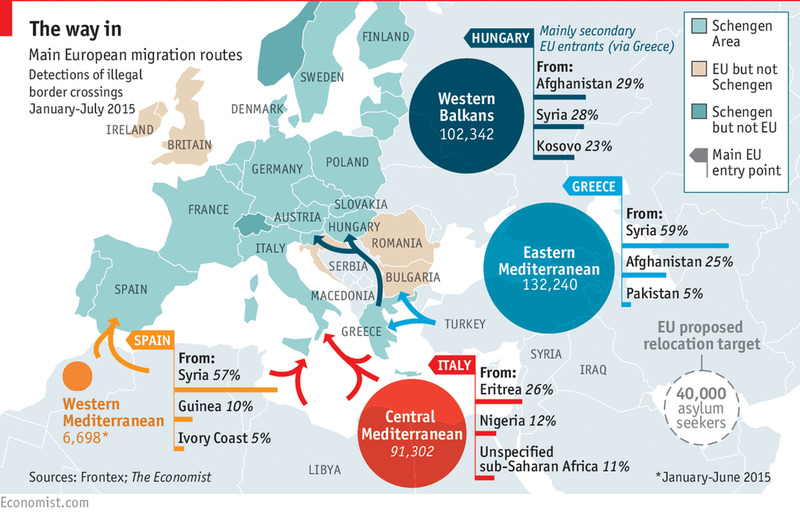 The map below (click to enlarge), shows the major flow of refugees into the EU between January and July of 2015. Task 8 - Using both maps above, describe and explain the changing distribution and concentration of asylum applications in EU and EU border countries in 2010 & 2014. Point of interest. Greece and it's islands had a low number of asylum applications in 2014 whereas Italy has a significantly higher number. Read the extract below from Hashem's story to remind yourself why this was. People turn their heads. A Greek plane? Are they still in Greek waters? It’s another cruel setback. 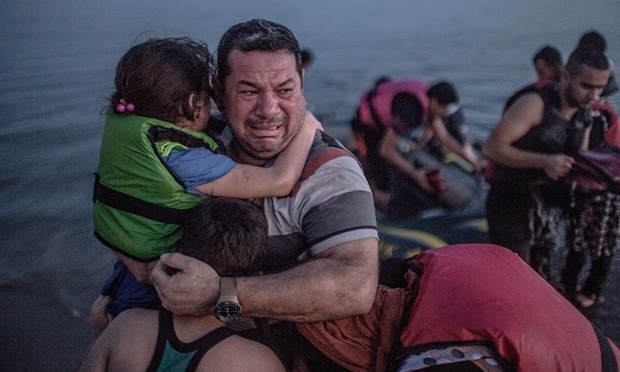 Greek waters mean Greek coastguards and a Greek rescue mission, and no one wants to go to Greece. Greece would be a disaster. Greece means walking through Macedonia and Serbia – two countries that lie outside the EU – to reach Germany. The passengers begin to shout. They paid for Italy, not for Greece, and they want the engines re-started. Nothing doing, says the captain. The coastguards have been called, and the die is cast. But no one will stand for it, and eventually he backs down. The captain fires up the engines, and the boat moves faster than ever towards Italy. Hashem collapses, shattered, into a deep sleep – not knowing whether or not they’ll reach Italy. 2015 has seen a drastic increase in the number of deaths of migrants trying to reach Italy. 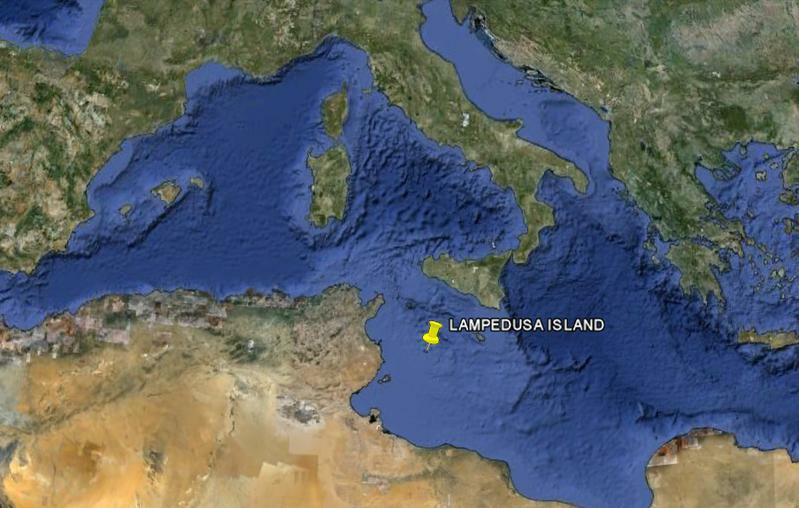 Many of these refugees travel by boat over the Mediterranean Sea to the closest Italian island of Lampedusa. If they reach the island, they hope to be able to start their asylum application and transfer to the Italian mainland and sometimes beyond. Task 9 - Watch the first video below. It explains to you where the migrants are coming from and makes efforts to explain what the push factors may be in those countries. Make notes on these. Task 10 - Watch the second video. This is a news report on one of the worst cases of migrant deaths in the Mediterranean Sea ever. What are the causes of these disasters? Who is responsible for these deaths? Could Italy do more? Think back to your work on Hashem's story and what happened to his friends. In 2015, it is clear that the journeys taken by migrants to get to the EU is changing as publicity of the thousands of deaths in the Mediterranean become public knowledge. Many are no longer willing to make such a dangerous crossing in substandard boats with a chance of injury or death. As we move in to the autumn and winter months, and as Mediterranean storms and the cooling of the sea water occur, this route will once again become more deadly. Check back to Task 7 and remind yourself of the asylum application numbers in Germany. Many migrants from Syria and North Africa now prefer to take the route into Turkey then a short boat crossing to reach one of the many Greek isles, notably Lesbos and Kos. 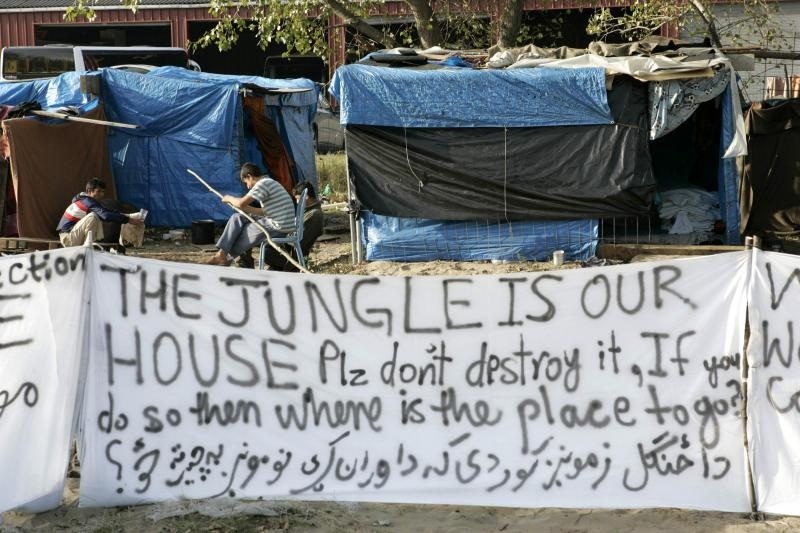 Once they reach Greece, they are in the EU. However, with the considerable economic restrictions in place due to the financial crisis, many migrants seek to move further north to Germany and the UK. 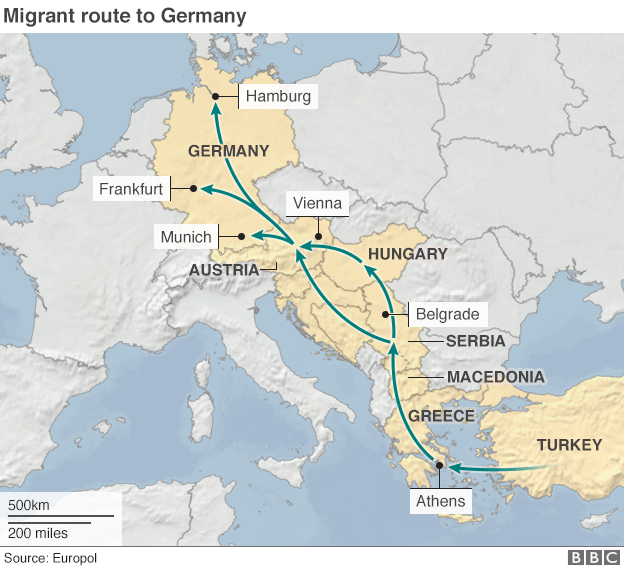 However, this is not a preferred route as it requires travel through Macedonia and Serbia - both non -EU countries. Use the map to the left as guidance and watch the videos to see the situation along the new migration route before attempting task 11 below. Video 4 - Migrants in Hungary Video 5 - Migrants in Austria Video 6 - Migrants in Germany. Task 11 - Complete the worksheet below by making notes of each of the intervening obstacles faced by migrants on their route across the Balkans (Turkey to Germany). After an already perilous journey across seas, deserts, mountains and multiple borders, some migrants travel to the north of France to the ferry and freight port of Calais to attempt to cross the channel via the Channel Tunnel whilst some even try to swim the 30 km stretch of the English Channel. Task 12 - Watch the Guardian documentary above and make notes on the concentration of migrants in the informal settlement, nicknamed 'The Jungle'. Make notes on how many migrants try to get to the UK on a nightly basis and the reasons why they want to claim asylum there. These notes can be made on the same worksheet you completed for task 11 in the space provided.